Summary: While the story and dialogue is hopelessly derivative, Eragon might have fared better if the pleasant, good looking Speleers were not so thoroughly insipid in the central role. Based on the first book in Christopher Paolini’s fantasy trilogy, published when he was just 18, Eragon was clearly optioned by studio bosses hoping to capitalise on the success of the Harry Potter and Lord of the Rings franchises. As such, it never ceases feeling like a calculated cash-in and exemplifies the weaknesses of the fantasy genre. The film’s paper-thin, archetypal characters will be instantly familiar to anyone who’s seen Star Wars, let alone read classical mythology or Tolkien, and the plot cranks towards its open-ended conclusion with all the objectionable assumption of a sequel to follow. Still, the Hungarian and Slovakian locations look fantastic and special effects expert Stefen Fangmeier, directing his first feature, has been gifted a stunning creation by Industrial Light and Magic (Star Wars) and WETA Digital (LOTR): the majestic dragon Saphira, voiced by Rachel Weisz. Graceful, and eventually, thrilling in flight and fearsome of flame, this imposing CGI entity shares a maternal, often flirtatious bond with the young Eragon (Edward Speleers), and it’s unfortunate that the actor can’t match his computer-generated co-star’s charisma. In the land of Alagaesia, dragon riders once protected the people, but driven by greed, rogue rider Galbatorix (John Malkovich) destroyed the rest and seized power for himself. Now, a warrior princess, Arya, (Sienna Guillory), has escaped from his castle with the final dragon’s egg. She is caught and imprisoned by Galbatorix’s sorcerer henchman, Durza (Robert Carlyle), but not before safely spiriting the egg into the possession of Eragon, an orphaned farm boy. Oblivious to the egg’s true nature, he tries to sell it for food, but when it hatches into a small dragon, forges a psychic telepathy with the creature, which has waited 2000 years to find him. As the dragon suddenly grows, Durza’s dark forces hunt them down and kill Eragon’s uncle (Alun Armstrong), but they flee with the help of Brom (Jeremy Irons), a grizzled old warrior who mentors Eragon in his heroic destiny. Shadowed by the enigmatic Murtagh (Garrett Hedlund), they set out to join a rebel army and rescue Arya, who has appeared to Eragon in a dream vision. 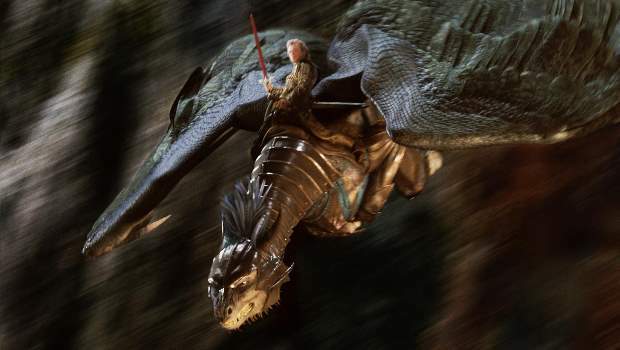 In the dramatic finale that follows, far and away the best scenes in the film, the two armies wage all out war as Eragon and Saphira engage Durza in fiery aerial combat. While the story and dialogue is hopelessly derivative, Eragon might have fared better if the pleasant, good looking Speleers were not so thoroughly insipid in the central role. The other younger cast members, Hedlund and Guillory, playing younger than her years, likewise come across as over-earnest, at odds with Malkovich’s fleetingly witnessed villainous camp. Only Irons and Carlyle emerge with any credit, the first delivering his tired lines with appropriate world-weariness and a cragginess recalling his role in Kingdom of Heaven, while the Scot is compellingly sickly-looking as the evil magician. Weisz’s plummy English tones initially jar in Saphira’s otherworldly jaws, but by the film’s completion it’s the flying reptile you feel the most affection towards.